A synopsis of an interview with Jim Rickards, New York Times bestselling author of The Death of Money and Currency Wars, by WHO Radio. In a currency war no one wins. The only way to win is to stay out of them, to maintain a sound monetary policy and maybe acquire some gold. If you’re in then everybody loses. The currency wars are now impossible to deny. Jim just returned from his second trip to Malaysia and Hong Kong in a month, along the front lines of the currency wars in Asia, and between the two trips the Malaysian currency the ringgit collapsed 30%. He spoke to a man from China who is in the shoe manufacturing business. China just cheapened their currency, so the man is selling to the US in dollars and paying his workers in yuan and should be making a nice profit. The man said he didn’t make a profit because his US suppliers called the day after China devalued and said they wanted an immediate 3% price cut. So any profit is going to the US suppliers who then cut their prices to the US consumers. If you’re out buying shoes in the US then it’s good because the prices just dropped, but the US is taking all the deflation in the world right now. All the currency wars, all the cheapening, all the cutting of the currencies is coming back to the US in the form of deflation. But the Federal Reserve has said that they want inflation not deflation. Things are cheaper in China because they cheapened their currency, but the US imports a lot from China so US goods are also cheaper. If you’re a consumer without debts then it’s good news. But if you owe money and your currency gets stronger then the amount you owe is higher in real terms. The US government is the biggest debtor in the world so the Fed wants to print money to get inflation and make their debt less in real terms. Everyone has been cheapening their currencies, and the US is like the last man standing, along with Switzerland and the UK. This isn’t just a China story. Last week Kazakhstan’s currency crashed 30%, Vietnam’s currency crashed, Canada’s dollar is down to $.75 against the US dollar. It’s going on all over the world. In currency trading, a move of 1/10th of 1% is a big day. Currencies don’t move that much, so when it drops 30% in a single day Jim calls that a crash. They don’t go to zero. The economies actually get a boost from more exports and tourism. It’s not bad for consumers, it’s bad for the US government because they are the biggest debtor in the world. Inflation is a way of stealing money from savers and giving it to debtors. The Fed wants inflation because they want to steal money from you and me. If you have savings, investments, pensions — any fixed income — inflation steals money from you and gives it to debtors. And the biggest debtor is the US government. That’s why the US government wants inflation. The problem is that they aren’t getting it. They’re getting deflation instead from all over the world because everyone is devaluing and the US is the only strong currency. Deflation is great for consumers buying shoes but it’s not good for Janet Yellen who wants to steal our money. In late 2014 Jim said the Fed would not raise interest rates in 2015. The ugly truth is that they can’t raise rates because the economy is on the brink of a recession. If Jim is wrong and Janet Yellen does raise rates then look out below, because you’re going to have an emerging markets crisis that’s worse than it was in 1997. Emerging markets are basically all the world economies out there other than western Europe and the US — Indonesia, Turkey, Brazil, China, Malaysia, Korea, etc. Capital doesn’t care. Capital just wants to make money. So it goes where it makes the highest yield. So if everyone is cutting rates and the US is raising rates then all the money in the world will want to come out of emerging markets and go into the US to get that higher interest rate. What does that do to the currencies and the stock markets and the investments in the emerging countries? It’s important especially if someone borrowed in US dollars (which happened a lot in China) but they’re paid in their local currencies, like the yuan in China. If the two currencies are stable it’s fine, but if the yuan goes down, like it just went down 4%, then you’re paid in a cheaper currency but still have to pay that debt back in US dollars. This is where contagion comes in. Jim doesn’t see Yellen raising rates but if she does then look out below. Recently, China officially stated they added 604 tonnes of gold to their holdings. This is their first report in six years. But they didn’t just go out and buy 604 tonnes the night before, they did it over the whole six years, which means they were lying about it the whole time. They posted 604 tonnes but they have thousands of tonnes. We have information from mining output, Hong Kong and other sources. They have a stash of some number, three or four thousand tonnes and maybe more, and they’re dribbling it out and now reporting 600 tonnes here and 500 tonnes there. They are officially acquiring a lot of gold off the books. The State Administration of Foreign Exchange is non-transparent and that is where China has the physical bullion. Jim has spoken to people in Switzerland, refineries, secure logistics people, people who drive armoured cars, and they’ve told him the gold is there but they’re just not reporting it. Jim has met privately with Rand Paul, Ted Cruz and Rick Perry, and he believes they’re very savvy and understand the international currency wars issue. He hasn’t met Donald Trump, but Richard Nixon imposed a 10% tarriff on imported goods on August 15, 1971, the same day he went off the gold standard, and the President can place tarriffs by Executive Order. So Jim wouldn’t underestimate Trumps ability to do something like that if he wins the Presidency. In a way it doesn’t matter who is voted in. The number of people who really understand these things, including Bob Rubin, Christine Lagarde, David Lipton — people who most have never heard of — are powerful figures who actually run the international monetary system. There’s no conspiracy and you can go and figure out who they are. So, we’ll see how it all plays out, but these figures are going to be there when he or she is sworn in as President, and they really call the shots. When it comes to money there is no left or right, and there is no ideology. There’s just money and it has a language of its own. The only way currency wars end is either systemic reform, where everyone sits around like Bretton-Woods and they cut a deal, or else systemic collapse. Both of those are in play and systemic collapse is more likely. The international monetary league are moving towards systemic reform around a form of world money called SDRs (Special Drawing Rights). The information is all on the IMF website, and it’ll hurt your head to read it but it’s all there. The SDR is world money printed by the IMF. They don’t have to worry about doing QE because they don’t have to sell bonds like the US Fed does. They don’t have to worry about a trade deficit. They just print them up and hand them out. The world is moving towards that, and the euro is a baby step towards it, but we’re not going to make it. The system is going to collapse before that. The IMF will try the SDR anyways on an emergency basis, but not in the cold and calculated way that they would prefer. In 1924 Hugo Stinnes was the wealthiest man in Germany, and one of the wealthiest people in the world. Germany had Weimar Hyperinflation in 1922-1923. Everyone got wiped out but Stinnes made a fortune. How did he do it? He bought coal mines (the energy of the day), shipping lines so he could move the coal, land, factories and gold. All hard assets. When the inflation came and the entire middle class was wiped out he was left standing, and became one of the richest men in the world. Today, in the short run deflation has the upper hand. It’s a tug-o-war and one team can win very quickly — it can switch from deflation to inflation overnight. Jim recommends his clients get some gold now. Don’t wait until you can’t find it. The Mint will stop shipping and the distributors will be backordered six months. Just put 10% of your investable money in physical gold. Get it now and just put it in a safe place. Gold is your inflation protection, 10-Year Treasury Notes are your deflation protection, and then have some cash so you’re protected no matter if inflation or deflation wins. Warren Buffett is doing what Jim calls a ‘barbell strategy’. Buffett is doing what Stinnes did with hard assets, buying a railroad and an oil and gas company, and he is also holding over $50 billion in cash. He also has deflation insurance because he bought a lot of insurance companies which own bonds. If deflation prevails then he wins on the bonds, if inflation prevails then he wins on the oil and natural gas and the railroad, and if it’s steady-as-she-goes or there’s a collapse then he uses his cash and buys everything dirt cheap. He wins any way and that’s fine, that’s the way to structure your portfolio. What is the dollar going to do? If the dollar gets any stronger it’s going to kill the economy. Expect the dollar to get weaker — it might be QE 4 and it might be helicopter money — but the Fed will do what it takes to get the dollar to weaken. The Fed thinks they can finess the economy up to 2 – 3% inflation. They won’t get there, but it’s hard to psychologically change a population from deflation to inflation and when it changes it can change quickly, so if the Fed can get it to go to 3% then it’s going to go very quickly up to 9%. If the American people change their psychology from deflation to inflation then you’ll have runaway inflation. It’s time to get your hard assets together. Not all, just 10%. Gold is at $1,159 US per ounce today. Everyone is jostling and more currencies are crashing. Tsipras resigned in Greece. I predicted it in the song “Not Much of a Holiday”, but it’s not much of a happy thing to say that. “Another knife and another one resigns” isn’t a peaceful lyric and there are more knives and backroom deals to come. Vietnam and Kazakhstan devalued their currencies and China devalued again. It’s the game of Coins and Crowns. As in the song “We Know How it Goes” lyrics “Time for paying up and laying low“. In the village it’s been hot and sunny. Went out gold panning in the woods last night. Felt like home. Went to a house jam in Lilloett this week on this huge hillside property with a handmade home in progress. Artist property. Artist house with driftwood doorways. Eighteen of us, including Matt Eakle, the flute player with Jerry Garcia of the Grateful Dead, and the David Grisman Quintet. Matt was stunning doing a solo piece and jamming. When it was his turn he asked me if I knew any Joni. I don’t do any Joni Mitchell covers (it would feel like covering God), so I sang my original “Six Feet” which quotes her. People traveling from all over the world were there, instruments included clawhammer banjo, violin, flutes, upright bass. Tried my first 1960s resonator guitar. I sooo want one now. My blowtorch and tanks arrive tomorrow and it’s on to lampwork for me. Excited. I’m working with a Vancouver area glass artist and I’ll show you what’s up soon. 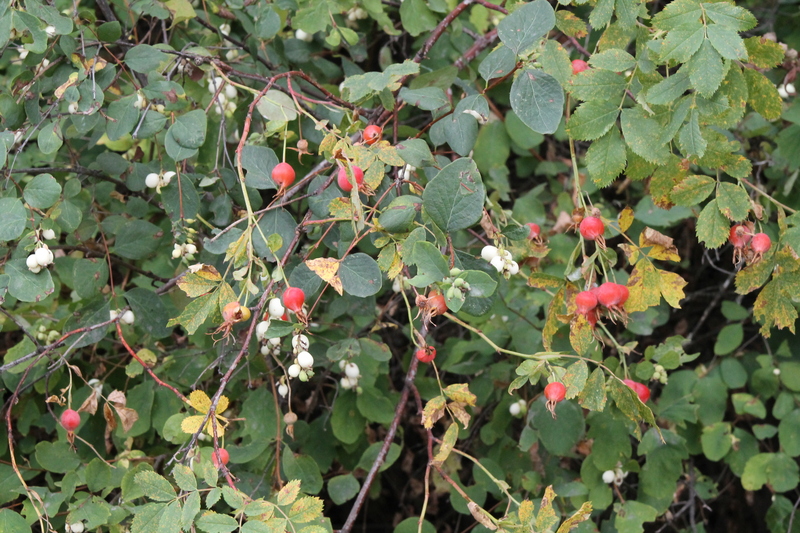 Picked rosehips this week, so this weekend it’s going to be wild rosehip martinis at a gathering. Yes, it is. 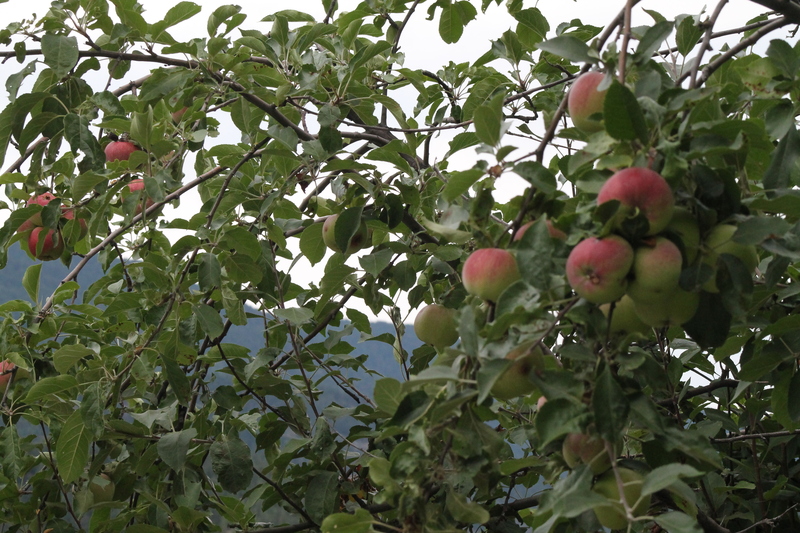 The low hanging apples in the abandoned orchard are all gone and the grass is trampled — the bears beat me to them! Time to pick a few from higher up!